Komline-Sanderson’s Peapack Headquarters and Manufacturing facility lie 35 miles due west (“as the crow flies”) of lower Manhattan at N40° 42.480′, W74° 39.552′ (N40.70800 W74.65920). 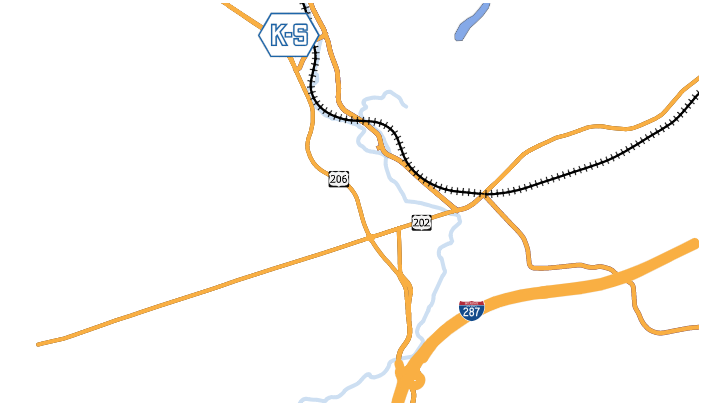 Take Interstate 78 West to Exit 29, exit right onto Interstate 287 Northbound for approximately one-quarter mile to second exit, number 22B. Exit onto U.S. Routes 202-206 Northbound. Pass through one traffic light then stay left as 202 and 206 diverge. Stay on US 206 North to the fourth light after 202 and 206 split (fifth light, a little more than three (3) miles, after exiting I-287). Turn right onto Holland Avenue (Peapack). Come up over the hill, then down the other side. K-S is on the left just before the railroad tracks. Take Interstate 287 South to Exit 22. Exit onto Northbound 202-206. Pass through one traffic light then stay left as 202 and 206 diverge. Stay on US 206 North to the fourth light after 202 and 206 split (fifth light, a little more than three (3) miles, after exiting I-287). Turn right onto Holland Avenue (Peapack). Come up over the hill, then down the other side. K-S is on the left just before the railroad tracks. Take Interstate 78 East to New Jersey Exit 29. Exit onto Interstate 287 Northbound (towards Morristown.) Go approximately one-quarter mile to second exit, number 22B. Exit onto U.S. Routes 202-206 Northbound. Pass through one traffic light then stay left as 202 and 206 diverge. Stay on US 206 North to the fourth light after 202 and 206 split (fifth light, a little more than three (3) miles, after exiting I-287). Turn right onto Holland Avenue (Peapack). Come up over the hill, then down the other side. K-S is on the left just before the railroad tracks. Take the New Jersey Turnpike North to Exit 10. Take Interstate 287 North to Exit 22B. Exit onto U.S. Routes 202-206 Northbound. Pass through one traffic light then stay left as 202 and 206 diverge. Stay on US 206 North to the fourth light after 202 and 206 split (fifth light, a little more than three (3) miles, after exiting I-287). Turn right onto Holland Avenue (Peapack). Come up over the hill, then down the other side. K-S is on the left just before the railroad tracks. Komline-Sanderson’s Main Plant and Administrative Offices are situated immediately adjacent to the Peapack Station on the Gladstone Branch of New Jersey Transit’s Morris and Essex Line. From New York (Penn Station) to Peapack takes a little less than one and one-half hours by train. Go to the New Jersey Transit website for more information, or check their schedules here, using Peapack as your destination.